The spine, also known as the vertebral column or spinal column, is a column of 26 bones in an adult body – 24 separate vertebrae interspaced with cartilage, and then additionally the sacrum and coccyx. 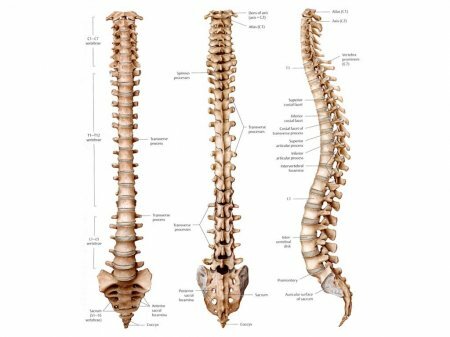 Prior to adolescence, the spine consists of 33 bones because the sacrum’s five bones and the coccyx’s four do not fuse together until adolescence. The vertebrae are named by the first letter of their region (cervical, thoracic, or lumbar) and with a number to indicate their position along the superior-inferior axis. For example, the fifth lumbar vertebra (which is most inferior one, located beneath the fourth lumbar vertebra) is called the L5 vertebra. Each vertebra has several important parts: the body, vertebral foramen, spinous process, and transverse process. - The body is the main weight-bearing region of a vertebra, making up the bulk of the bone’s mass. - Extending from the body, the transverse processes are thin columns of bone that point out to the left and right sides of the body. - The spinous process extends from the ends of the transverse processes in the posterior direction. - Between the body, transverse processes and spinous process is the vertebral foramen, a hollow space that contains the spinal cord and meninges. Between the vertebrae of the spine are thin regions of cartilage known as the intervertebral discs. Intervertebral discs are made of an outer shell known as the annulus fibrosus and a soft, pulpy region known as the nucleus pulposus in the middle. - The annulus fibrosus is made of tough fibrocartilage that binds the vertebrae together but is flexible enough to allow for our movements. - The inner nucleus pulposus acts as a shock absorber to support the body’s weight and prevent the vertebrae from painfully crashing into each other while under strain. The vertebrae of the spine align so that their vertebral canals form a hollow, bony tube to protect the spinal cord from external damage and infection. Between the vertebrae are small spaces known as intervertebral canals that allow spinal nerves to exit the spinal cord and connect to the various regions of the body. 1. Cervical: The 7 vertebrae in the neck form the cervical region of the spine. Cervical vertebrae are the thinnest and most delicate vertebrae in the spine but offer great flexibility to the neck. The first cervical vertebra, C1, supports the skull and is named “atlas” after the Greek titan who held the Earth on his shoulders. The skull pivots on the atlas when moving up and down. The second cervical vertebra, C2, is also known as the “axis” because it allows the skull and atlas to rotate to the left and right. 2. Thoracic: The 12 vertebrae in the chest region form the spine’s thoracic region. Thoracic vertebrae are larger and stronger than cervical vertebrae but are much less flexible. The spinous processes of the thoracic vertebrae point inferiorly to help lock the vertebrae together. A unique feature of the thoracic vertebrae is that each one forms joints with a pair of ribs to form the sturdy rib cage that protects the organs of the chest. 3. Lumbar: The 5 vertebrae in the lower back form the lumbar region of the spine. Lumbar vertebrae are even larger and stronger than thoracic vertebrae, but are more flexible due to the lack of ribs in the lumbar region. All of the upper body’s weight bears down on the lumbar vertebrae, leading to many back problems in this region despite the size and strength of the vertebrae. 4. Sacral: The sacral region of the spine contains only the sacrum, a single bone in the adult skeleton that is formed by the fusion of 5 smaller vertebrae during adolescence. The sacrum is a flat, triangular bone found in the lower back and wedged between the 2 hip bones. 5. Coccygeal: The spine’s coccygeal region contains only the coccyx, a single bone in the adult skeleton that is formed by the fusion of 4 tiny vertebrae during adolescence. The coccyx is often referred to as the human tailbone, as this region is homologous to the tail bones of animals that have tails. In humans, the coccyx bears our body weight when sitting down and provides attachment points for muscles of the pelvic and gluteal regions. While most people have a coccyx made of 4 fused vertebrae, the coccyx may consist of as few as 3 or as many as 5 vertebrae. The length of the coccyx has no effect on the body’s function.